What has happened to our dear, sunny Florida?! Why must you torture us with iced over windshields? 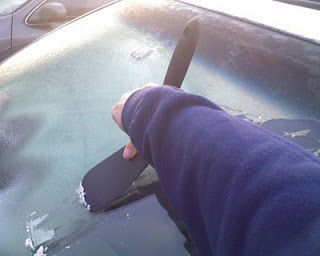 Doesn't the weather know that I'm going to be late for work trying to figure out how to get the ice off because I don't own an ice scraper (I live in Florida!). Note to Floridians: Spatulas work quite well (though your roommate may be grossed out by this intuitive thinking). Why didn't you just use one of your thousand cards from your wallet? Didn't think about that...that would be a good idea too.